Time, and capabilities, have changed. Chinese tech firms once simply mimicked Silicon Valley products, from search engines to e-commerce and social networks. Now the copycats have become pioneers. WeChat, a messaging app run by Tencent with endless bells and whistles, for example, rivals anything from California. Mainland firms are thus ready to make a strong play for markets which neither they nor American firms can call home. Rising incomes, ballooning smartphone use and improving internet infrastructure in emerging markets make them irresistible terrain for all tech firms. As they vie for the next billion consumers to come online, Alibaba is taking on Amazon, Google is matched against Baidu and Tencent can prove its mettle against Facebook. They have very different strategies, however. American firms typically set up outposts from scratch. They fund subsidiaries that offer much the same service to Indians or Mexicans as their domestic users might expect. Amazon’s foray into India, for example, involved it pledging over $ 5bn to broadly replicate its American offering. It has built a network of warehouses to fulfil e-commerce orders, rolled out its Prime video service (with added Bollywood content), website-hosting services and so on. It rebrands acquisitions. Last year it paid $ 650m for Souq.com, an e-commerce website based in Dubai, now clearly marked as “an Amazon company”. Google and Facebook also provide offerings abroad similar to those that consumers get in America; as a result, both are as recognised in Brasilia or Bangalore as they would be in Boston or Berlin. Google customers worldwide use the same Chrome browser, YouTube website or Android phone-operating system—and are served advertisements in much the same way. WhatsApp and Instagram, both owned by Facebook, are popular across the world. By contrast, few Indonesians or Indians would recognise the name Alibaba. Its strategy in emerging markets has been not to set up shop itself but instead to invest in local players, whether by buying them outright or taking a minority stake. In the past two years or so it has built a constellation of firms focused on shopping, payments and delivery. These include Paytm and BigBasket in India, Tokopedia in Indonesia, Lazada in Singapore, Daraz in Pakistan and, as of July 2nd, Trendyol in Turkey. Most of their customers would have no idea that these apps are backed by a Chinese tech titan. Tencent has similarly ploughed money into a clutch of Indian firms in areas as diverse as ride-hailing, online education, music-streaming, health care, IT and e-commerce, as well as Nigerian payments and Indonesian logistics. 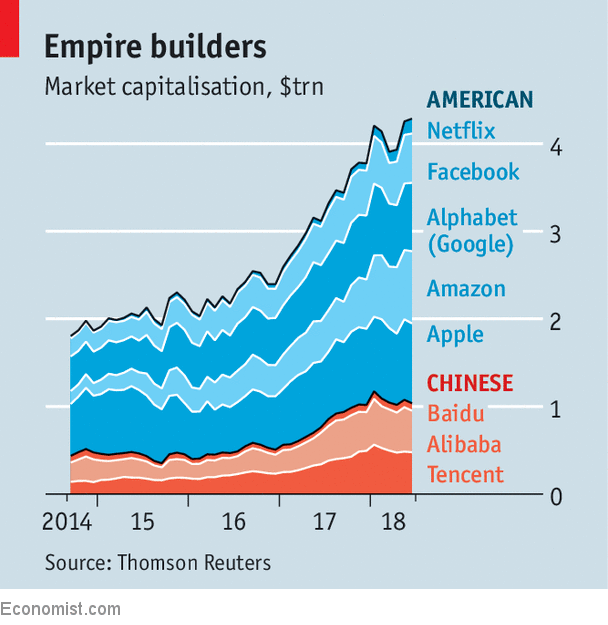 (Baidu is the least active thus far in building its emerging-market presence, but its heavy investment in artificial intelligence could result in its technology being used globally in self-driving cars, for example.) According to CBInsights, a data firm, Tencent, Alibaba and its Ant Financial affiliate have backed 43% of all Asian “unicorns”, meaning startups worth more than $ 1bn. Alibaba’s investment in Lazada, South-East Asia’s largest e-commerce platform, has soaked up $ 4bn. Jack Ma, Alibaba’s founder and boss, has pledged $ 8bn to India alone. Their different approaches reflect the way the Western and Chinese firms make money. Google and Facebook earn the bulk of their revenue from advertising against services their users flock to. This requires little localisation, bar a bit of website translation to attract native users. Chinese firms’ competitive advantage, by contrast, has historically come from being able to process payments and organise distribution of goods in a country where doing such things had previously been tricky. A business based on solving such nuts-and-bolts problems is hard to export. “For that sort of thing, it is difficult to have a one-size-fits-all approach for different countries,” says Tan Yinglan of Insignia Ventures Partners, a tech-investment firm. Being a distribution expert in Singapore (whose former postal monopoly is now 14% owned by Alibaba) brings little insight into distributing packages throughout Indonesia’s 17,500 islands, say. Nor does the ability to process payments in Vietnam smooth transactions in Brazil or in Nigeria, with their vastly different banking and regulatory systems. Such intricacies, in other words, might be better delivered by local entrepreneurs who can be bought out once they have cracked them. How are these differing strategies panning out on the ground? The most intense Sino-American rivalry thus far is focused on India and South-East Asia. The scale of investment reflects the stakes: Indian start-ups received $ 5.2bn in Chinese tech money last year, according to Tracxn, a data provider, up from $ 930m in 2016. Forrester, a market-research group, says that Chinese tech giants (including Didi and JD.com) spent $ 6bn on acquisitions in South-East Asia in 2017. The Chinese firms have several advantages. They have a proven record of chaperoning hundreds of millions of emerging-market consumers onto the internet. A Chinese diaspora in places like Malaysia or Vietnam, paired with plenty of mainland tourists, offers a beachhead into those markets. The Chinese giants also enjoy the tacit support of their country’s government, which is keen for them to expand in “Belt and Road” countries near China. Startup founders in Asia are more likely to want to emulate Mr Ma than his American counterparts; they will certainly prefer the Chinese approach if they want to keep running their firms. 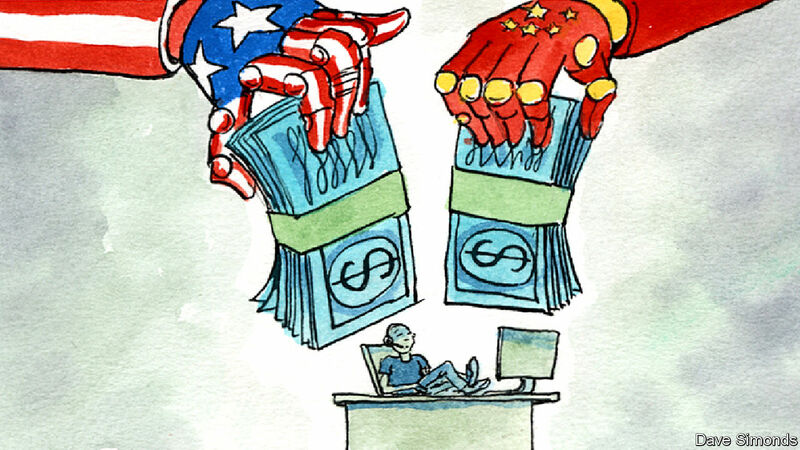 Yet to critics, the Chinese approach is akin to what corporate Japan did in the 1980s: overpay for trophy assets in a hopelessly undisciplined way. Chinese firms sometimes end up competing against themselves. Tokopedia and Lazada in Indonesia sell similar stuff and are both backed by Alibaba, for example. Its investment in Paytm came only after it had bet on Snapdeal, a former Indian e-commerce darling whose star has dimmed markedly. Valuations can be eye-popping. That is partly because there is a lot of capital about. Venture capitalists worried about losing their relevance in the region want to stay invested. SoftBank, a risk-loving Japanese group that is attracted to fashionable startups like a Brazilian to a football trophy, is among those who made a fortune in China (it is Alibaba’s biggest shareholder) and is keen to repeat the feat in other rising tech powers. The Americans’ edge lies with their record and their head start. The Silicon Valley giants internationalised operations more or less from the start. Amazon’s British and German arms are about to celebrate their 20th anniversaries. It is easier for English-language firms than for Chinese ones to hire staff or to attract users. Over half of Google’s and Facebook’s revenues already come from outside America. Alibaba, the most internationalised Chinese firm, is barely at 10%, though it hopes half the value of the stuff sold through it will be transacted overseas by 2025. Global heft counts for something in local battles. Services such as Amazon’s movie-streaming offering can be rolled out from one country to the next, as can its relationships with global suppliers. That has made it cheaper to set up foreign outposts than to acquire them. Amazon has probably spent about $ 3.5bn to date building its Indian operation, where it is largely on a par in terms of market share with Flipkart, a local e-commerce site which has raised nearly double that in equity and debt. The downside of the American approach is that subsidiaries are wedded to a business model that proved itself in completely different circumstances. Like the Chinese, most Asian consumers use only mobile phones to access the internet; the American trio made their first fortunes through PCs. Some think the executives dispatched from head office lack the fizz of the local entrepreneurs they are taking on, and rely overly on lavish cheques from head office. The two models could yet both be proved right, and start to converge. The advantages of being part of a global outfit might be decisive in delivering some services, such as search or social media. Alibaba is pushing its own branded B2B platform for Indian small businesses, helping them sell their wares abroad and, in this instance, expanding in much the same way that an American rival might have done. In other areas, where local nous matters more, American groups might adopt a more Chinese-style approach of building an “ecosystem” of allied firms. Amazon was said to be interested in buying Flipkart, in which Walmart is now buying a majority stake (in part from Tencent); Google is still said to be mulling a minority investment. On June 17th Google invested $ 550m in JD.com, a Chinese e-commerce firm which has spent lavishly on startups in Indonesia, Thailand and Vietnam. User numbers for services that are free of charge in emerging markets are inevitably mind-boggling—eight of the ten countries with the largest number of Facebook users are emerging markets, led by India with 270m. Whether that will translate into a commensurate level of revenue and profits is less clear. For all the excitement around Indian e-commerce, say, only about $ 27bn-worth of stuff is shifted online in India each year—about what all Chinese e-commerce firms sell in just nine days and American ones in three weeks. South-East Asia is smaller still. No matter, so far as the tech firms are concerned. Winning the next billion users is seen as an investment worth making at almost any cost. Chinese tech giants must reckon with a dwindling number of new recruits to the internet at home; they also have the confidence, clout and capabilities to expand abroad. America’s titans might once have expected to face meek local rivals in emerging markets; now they have a fight on their hands. It is one they could barely have imagined four years ago, when those other titans, of the footballing ilk, were last challenging for global glory.